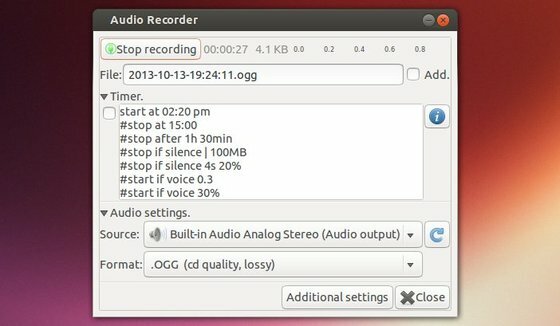 This quick tutorial is going to show you how to install Audio Recorder in Ubuntu 13.10 Saucy Salamander & Linux Mint 16 Petra via Getdeb repository. As you may know, audio-recorder allows you to record your favourite music and audio to a file. It can record audio from your system’s soundcard, microphones, browsers, webcams & more. Put simply; if it plays out of your loudspeakers you can record it. The recording can be atomatically controlled by MPRIS2-compatible media players. It can also record all your Skype calls without any user interaction; It supports several audio (output) formats such as OGG audio, Flac, MP3 and WAV. It even allows you to select the recording device (microphone, webcam, audio card, etc.) which you practically CANNOT DO with GNOME’s official recorder. It’s so pathetic! Will this work on Mint 13 LTS which is based on Ubuntu 12.04? I will upgrade in 2017 when I loose support for Mint 13.